An over-achiever by any measure, at the age of 24, he had completed his university education in Economics and Law, and was inducted into the prestigious Indian Administrative Service. Although a native of Tamil Nadu, Mr. Chakravarthi opted to serve in the Andhra Pradesh cadre, because it was home to the Lord Venkateshwara shrine at Tirupathi. Born and raised in the Vaishnavite spiritual tradition, he found it hard to resist the draw of the Lord at Tirumala. During his 15 year tenure both in the central and state governments, he earned himself a reputation for his competence and integrity. The turning point in Mr. Chakravarthi’s life came when he was posted as the Collector of the Anantapur district in Andhra Pradesh, the very jurisdiction within which lies Puttaparthi. At the insistence of his wife, Mrs. Sudha Chakravarthi, and his colleague, Major Vishwanath, he visited Prasanthi Nilayam for the first time in 1975. Bhagawan's very first words to him were, “I may be new to you, but you're not new to me.” The declaration proved prophetic, as it led to a completely unplanned and unscheduled detour in the life of the Chakravarthi family. At the peak of his professional life, at the age of 45, Mr. Chakravarthi shifted his gears from I.A.S to S.A.I. 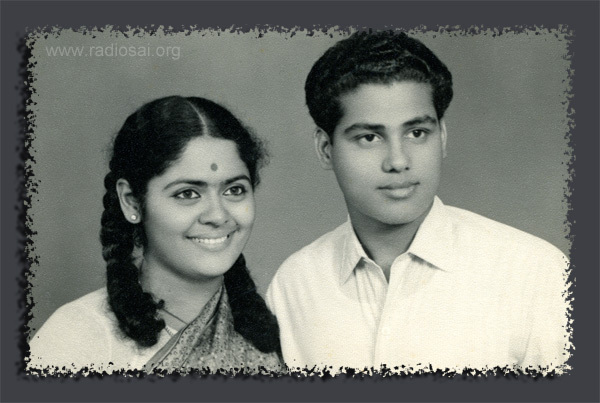 Today, for the past 31 years, Mr. and Mrs. Chakravarthi have been full-time ashramites, living here in Prasanthi Nilayam, and serving the Sai mission. Here are edited excerpts from Mr. Chakravarthi's only media interaction in which he offers rare glimpses of his moments with Divinity, while serving the Lord at very close quarters. This exclusive interview with Radio Sai's Karuna Munshi (KM) was first aired on November 23, 2012, on the occasion of Bhagawan Baba's 87th Birthday. KM: Sai Ram Sir, you are one of the most seen, and perhaps talked about office-bearers of the ashram, and yet you have remained very private, and media averse. During the period when Bhagawan was hospitalized, your name was making headline news on a daily basis, but we never heard from you. So let me start off by thanking you for coming to the Radio Sai studio for this conversation. Let's talk about life before and after that fateful day when Bhagawan was rushed to the Super Specialty Hospital - March 28, 2011. As the Secretary of the Trust at that time, and His close devotee, what do you recall of that day? K. Chakravarthi: All that we can say is we were all traumatized. I had just come home from Prasanthi Nilayam, and half an hour later, I got a frantic call from the Yajur Mandir saying that Swami has to be rushed to the hospital, and that I should get back to Yajur Mandir. Hardly few minutes later, I was back in Yajur Mandir and we had to arrange the ambulance. The doctors were there and Swami had to be brought down. 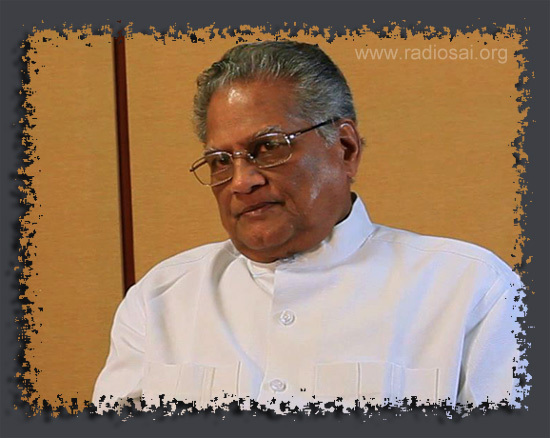 It was a fairly hectic time, and our reactions were rather slow, because however much we knew that Swami was not well, we were not mentally prepared to see Swami in a condition in which He had to be rushed to the hospital in an ambulance. And I think my mind was blank. All that I could do was I showed Swami (by gesture) that I am following His ambulance. So I went behind Swami's ambulance in my car. KM: Was Bhagawan awake and conscious at this time? K. Chakravarthi: As He came down, He was visibly conscious. He was in a chair; we had to take Him sitting in His chair. To what extent could things around Him have registered is very difficult to say. Well, we presume that He was, I think, in a condition in which He was at least aware of what is around Him, who were around Him. That's how it happened. KM: The days that followed, were obviously very difficult for everybody, especially so for the members of the Trust – constant media attention and then the responsibility of handling the situation in the hospital. What was it like? K. Chakravarthi: It is a question of being caught unawares firstly, because it is not as though that we were planning to take Swami to the hospital for a long treatment. At least I was always hoping that there will be some unknown, mysterious way in which Swami would pull Himself up and therefore there will be no need for Him to go to the hospital. Now having gone to the hospital and being told that His condition is serious, it was a question of waiting during those days; in other normal cases, people would expect recovery of their loved ones. But here was a case where I suppose more than He being the beloved of many, it was always a question of His extraordinary power by which He could recover Himself. At one level your mind says “We have got to go through the normal procedures”, at another level I suppose you're not prepared to believe that these are the things which have got to be done as in the case of an ordinary patient. It is very difficult for any person, not only me; I think it would have been the normal reaction of many people there. So, it became, a very prolonged stay. And a prolonged stay means you can think of it as a time for recovery. You can also think of it as a situation which is going downhill, physical condition being what it is. So, it is very difficult to look back and say precisely this is the moment in which hope was lost. KM: Understandably! And then once the Mahasamadhi happened on April 24, 2011, and for millions of devotees around the world, life just changed in a trice, but in your case it was even harder because you had the loss, the grief, as well as the added responsibilities to handle because the entire world was descending into Puttaparthi. What was going through your mind? K. Chakravarthi: I didn't think that I was in any way responsible for handling many things which are happening around. No one could have thought that he's going to handle it single-handedly. KM: But you were the Secretary of the Trust? K. Chakravarthi: Yes, in terms of working out the details of when Swami's Body should be received, and how people will be allowed to offer their obeisance - there were details, which had to be addressed and you do it either mechanically or because you have been through a lot of training on handling situations. This was such a life-changing happening in the whole ashram, not only for me, but for everyone around. And perhaps for people who have not been around also. But then, I was not the only person. There were lots of others who were also in the hospital during those critical days, and all of us had to talk amongst ourselves and see what should be done, and even before the end came, there were lots of enquiries from people, from the Prime Minister's office, the Chief Minister's office, and as soon as the end came, we knew that we had to arrange for their coming and paying their last homage to Bhagawan. So all those things were handled in a way in which activities in the ashram are handled when the VIPs come or when a large congregation of devotees comes. But this was a totally different type of congregation, a totally different type of visit of the very important persons in the country. But as I said, we knew that this has to be gone through, and I think all the people who are connected with this in one way or the other must have gone through in their own mind, I suppose, that this is something which mentally we were not prepared to accept. KM: It's very hard to draw that strength in the moment of grief and loss and to stay together, and think of the logistics, I can't even think of a Head of State who has had such a send-off. K. Chakravarthi: In certain cases like that, you prepare in advance, as to what should be done, what should be the protocol, etc. In the case of Bhagawan, it is rather difficult, because if you start preparing, it looks as though you have accepted the inevitable, and you do not allow for a margin of mystery. And if you don't do anything at all, it looks as though you have been careless in handling the situation. So it is very difficult to prepare, and to stay not prepared. KM: Indeed a fine line to walk. K. Chakravarthi: Either way, you know people can say that 'well, they knew much earlier and they did not prepare.' Or they can say, 'they should have foreseen but they didn't.' So it was a very difficult situation. KM: Talk of walking on a razor's edge! Now during this period, Sir, suddenly the Trust was making a lot of headline news and it was often being described as the all-powerful Sri Sathya Sai Central Trust with global assets worth some astronomical amount, and the spotlight was on the Trustees from both the media and the devotees. Yet, it appears you consciously chose to lie low and stay away from the limelight. Why? Was that a considered decision? K. Chakravarthi: Now, I think there are a few things in this. Many of the comments which I found in the press had not been based on information on facts. K. Chakravarthi:And none of the people who had written anything had met me or, for that matter, any of the trustees earlier to ascertain the facts about what they are going to write. So I think it was more of a speculation in terms of the Trusts' property and its worth. The difficulty at the time was that when people wrote that the Central Trust has assets running into thousands of crores, it was an instance of utter incredulity for us. We know what the situation is; we know how much assets are there. 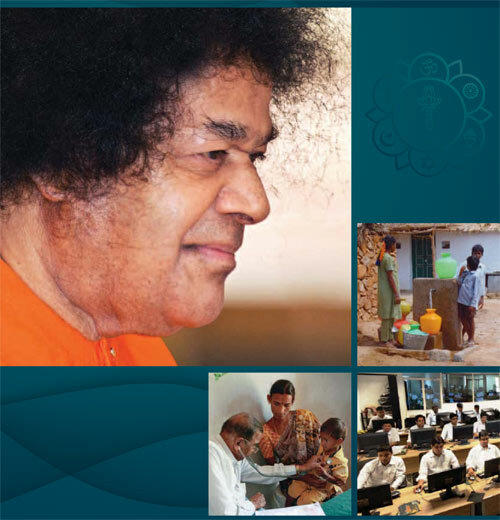 And we had to possibly bring to their notice that there are a number of organisations all over the country and the world which bear the Sri Sathya Sai name. They are not directly connected with the Central Trust as an entity. We had to tell them there are Sri Sathya Sai State Trusts, and other sister Trusts, and there is an Organisation abroad which is not a legal entity, the Sri Sathya Sai International Organisation. These are all again totally outside the purview of the Central Trust, and we had to inform that the territorial jurisdiction of the Central Trust is only India, and Sri Sathya Sai Central Trust is one organisation which does not own any property in any part of the world other than India. So I think these must have come possibly as a surprise to them, but at the same time having made wild guesses about the worth of the Trust, perhaps they didn't want to revisit those figures and they just came to a certain understanding of the facts as they were put out to them. KM: It must have been a very difficult time for the Trust to grapple with the situation on the ground as well as the negative media attention. Did you all strategize on how to handle it? K. Chakravarthi: See, the question is that, it is not the Central Trust alone that was being asked. We can say that we should have people who are connected to the Central Trust, who can give some facts and figures. Now immediately after such a great traumatic event for all of us, it was not possible for us to come and meet the press in a very cold-blooded way and say that these are the facts. So, we had to allow really for all people to sort of settle down as it were. KM: Because some closure was required. K. Chakravarthi: And there was a need to gather one's wits under such circumstances and then together reckon what are the things being asked in relation to what happened. We had to really think in terms of giving a write-up itself. There’s no point in just giving explanation. We put forth a write-up and said that these are the facts. KM: Yes, and the Annual Report. K. Chakravarthi: (We had to tell them) These are the lands that we have and these are the buildings; and these are connected with the work. The lands that were given by the Governments of the states of Andhra Pradesh and Karnataka, and these were all for specific purposes, and those purposes have been carried out by Bhagawan till now and will continue to be carried out by the Central Trust. If you talk in terms of the value of assets, you will find in our books of accounts as zero, because these were all given free, and today's market value may be anything, you can compute, but then these are not real estate in the sense in which we sell the property, make money or do anything of that nature. These are linked to certain obligations on part of the Central Trust. If land is being given by the Government of Andhra Pradesh for Anantapur Campus, it is being run for more than 30 years as a university. And even earlier as a college and this is a continuing obligation of the Central Trust. We have to do that and take care of it and ensure that the campus of the university there runs. Similarly, if there is a land given by the Government of Karnataka to the Central Trust for putting up a building for housing a free Super Specialty Hospital, it again is an obligation. The land has been given but once again on the condition that we would run a free hospital. So in fact you should look at it not as an asset; it is as an obligation made out by the Government; each so called “asset” has an obligation attached to it. It takes time for people to understand that if you have some acres you don't multiply it by the current market value, and say that this is asset value and so on, and even there again, in the books of accounts, it will be shown for whatever value in which it was given. So I think it took time for people to understand that the value of the property which they had given had no basis on facts pertaining to the Central Trust. And if they had thought that because the name Sri Sathya Sai is there, all of them come under the umbrella of Central Trust, it was not so. And I think it took some time for them to understand that the Sri Sathya Sai Organisation is different from Sri Sathya Sai Central Trust, and Sri Sathya Sai State Trusts are different from the Sri Sathya Sai Central Trust. So I think it has taken some time but I'm sure people have now come to understand what all these are about.